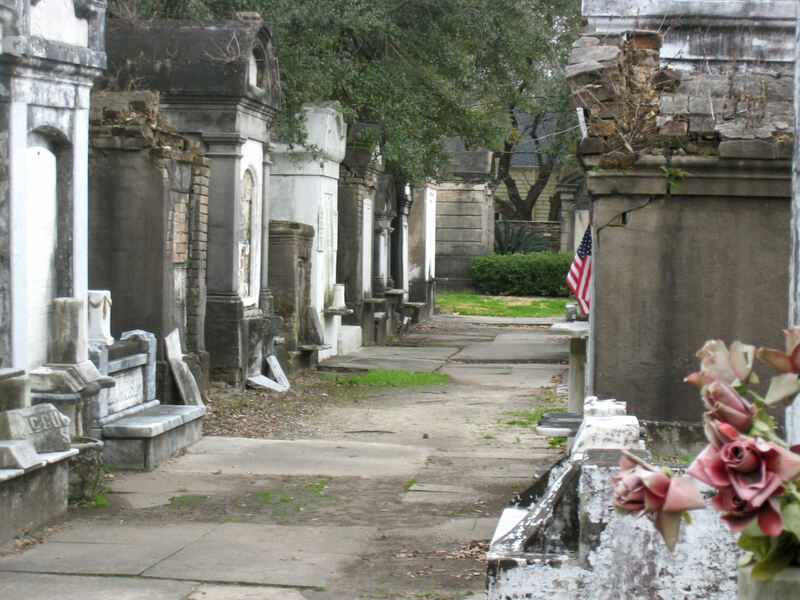 More than 90% of burials in New Orleans cemeteries are above ground. 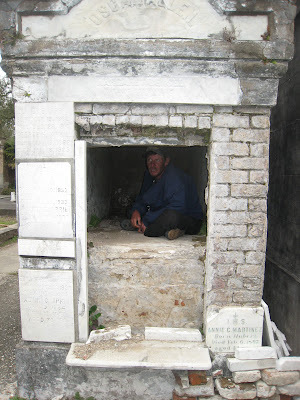 Frequently the widespread adoption of this tradition is attributed to the high water table of the city, yet no other cities with similar water table levels have such a high percentage of above-ground burials. 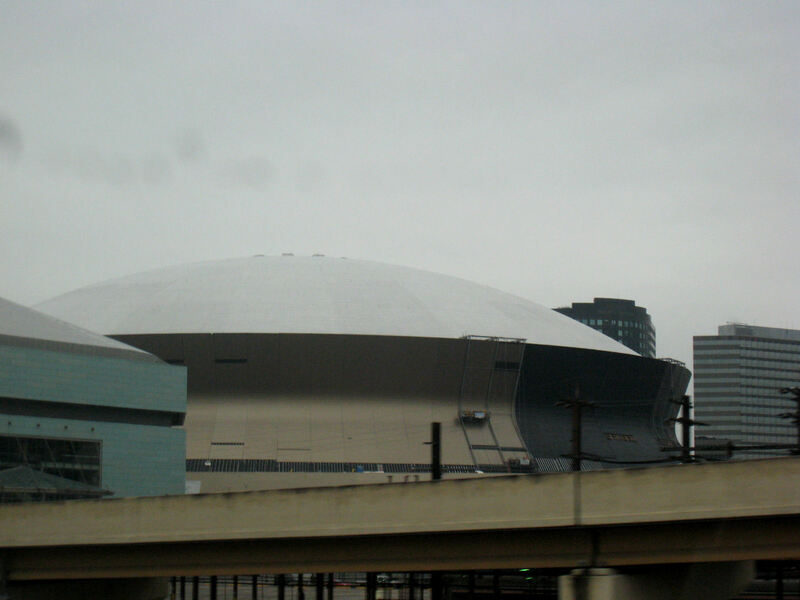 A unique combination of additional factors pushed New Orleans into this practice. 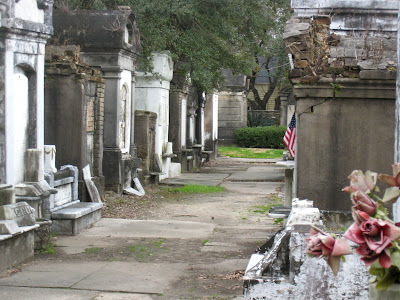 In the city's first formal burial ground, located in what is now the French Quarter, graves frequently filled up with water when they were dug, causing caskets to float. 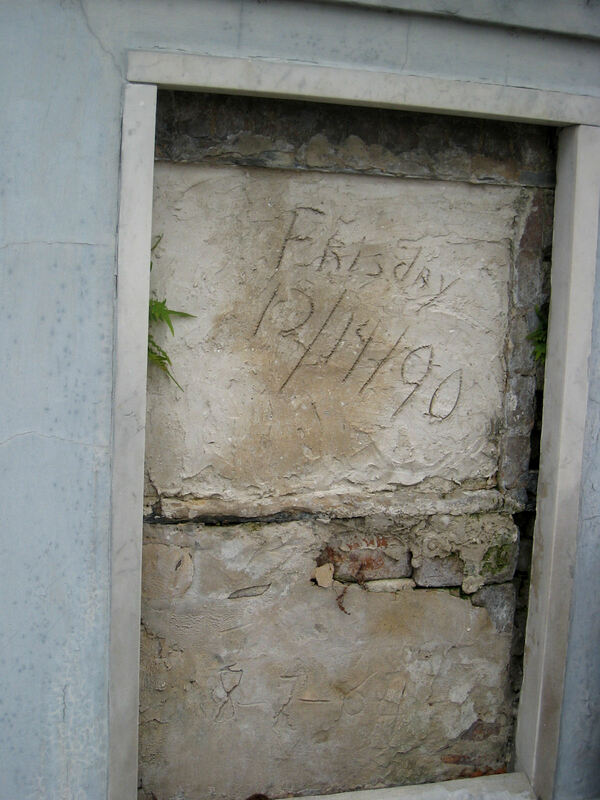 When this original graveyard neared capacity in 1789, Spanish officials who were in control of the city decreed that the wall vault system then popular in Spain would be used in the new cemetery, although some ground burial was also permitted. Above-ground burial was made a requirement in the 1830's after several disease epidemics were blamed on toxic fumes emitted by corpses. 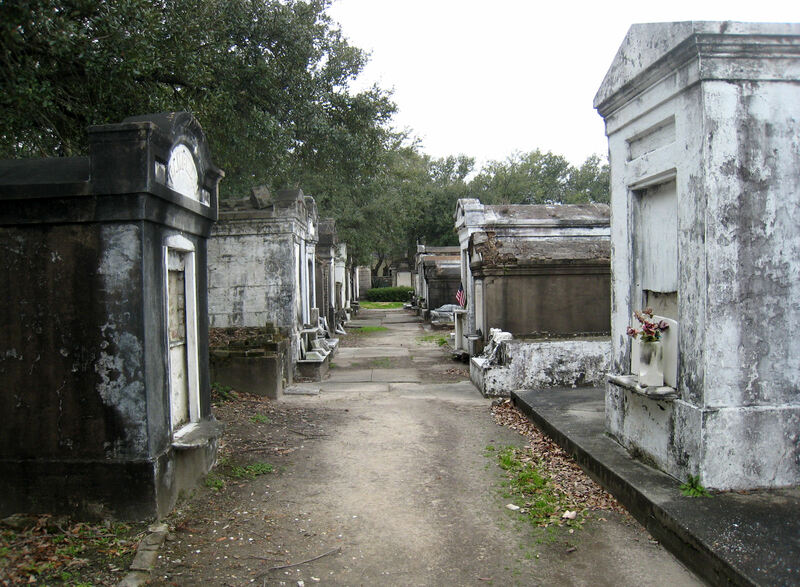 Since the shape of these above-ground vaults often resembles miniature houses laid out in patterns similar to city streets, the cemeteries of New Orleans are often referred to as "cities of the dead." 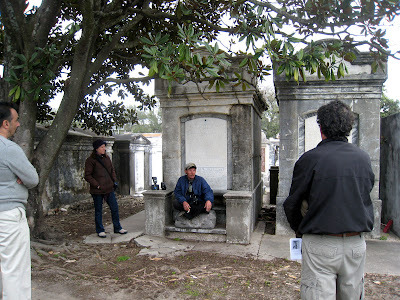 We went in search of a letterbox in one of these "cities"-- the Lafayette Cemetery #1 in New Orleans' Garden District. 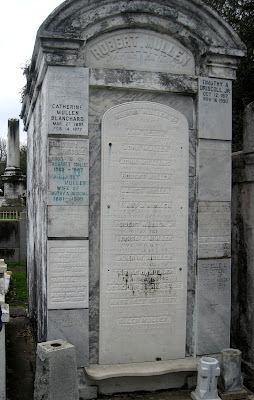 After locating the box and stamping in, we were wandering around the graveyard musing about why so many names were listed on the various vaults. It was then we encountered Sean, who calls himself the "pro bono caretaker" of the cemetery. Sean marshaled up the other half dozen tourists who were visiting the cemetery and proceeded to give us all a guided tour of this historic burial ground. 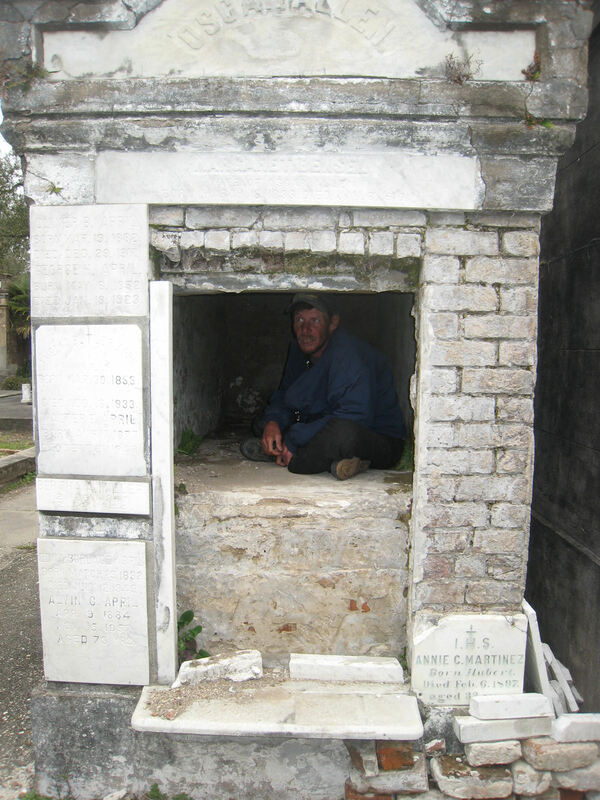 He explained that like a house, the vaults of New Orleans families are not reserved for just one person. A family's vault may have two or three chambers, each of which houses the remains of many family members. By local ordinance, as long as the previously deceased family member has been dead for at least two years, the remains of that person can be moved to a specially made burial bag and put to the side or back of the chamber. Whatever remains of that coffin is then destroyed and the chamber is ready for the newly deceased family member. Sean entered one of the chambers to demonstrate how he goes in to clean it to make way for a new interment. 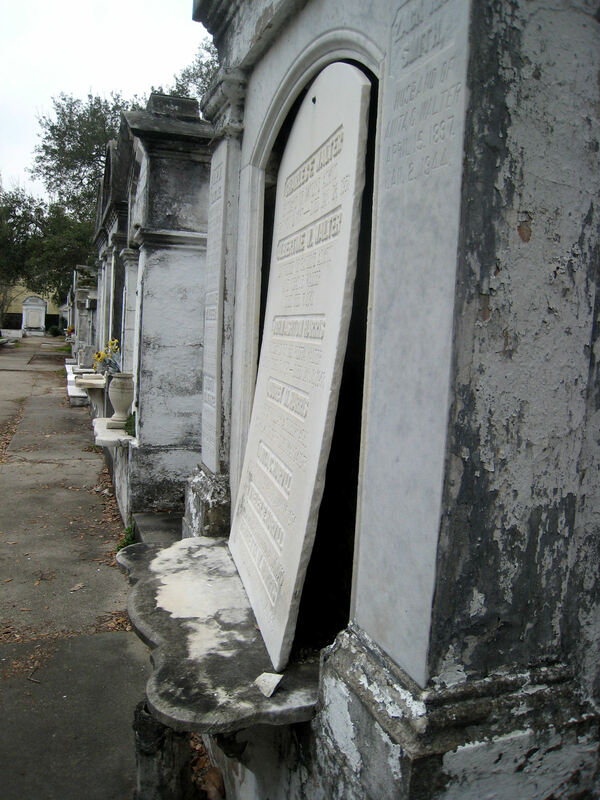 If a family member dies before that two year time restriction has expired, most local cemeteries are equipped with temporary holding vaults where the deceased family member is kept until their final resting place is available. After each burial, the chamber entrance is bricked up and plastered. The date of the most recent interment is recorded on the plaster. Then the marble plate with the names of the deceased is restored. Sean provided a very interesting tour, sprinkled with ample personal opinions about various groups and political issues in New Orleans. Opportunity was presented for donations to the cemetery and he gave each of us the URL of the web site he maintains for the cemetery (http://lafayettecemetery.org/). The site offers a fascinating look into his work and his viewpoints. Almost five years after one of the deadliest hurricanes in U.S. history struck New Orleans, Katrina search team codes are still visible on many buildings in the city. 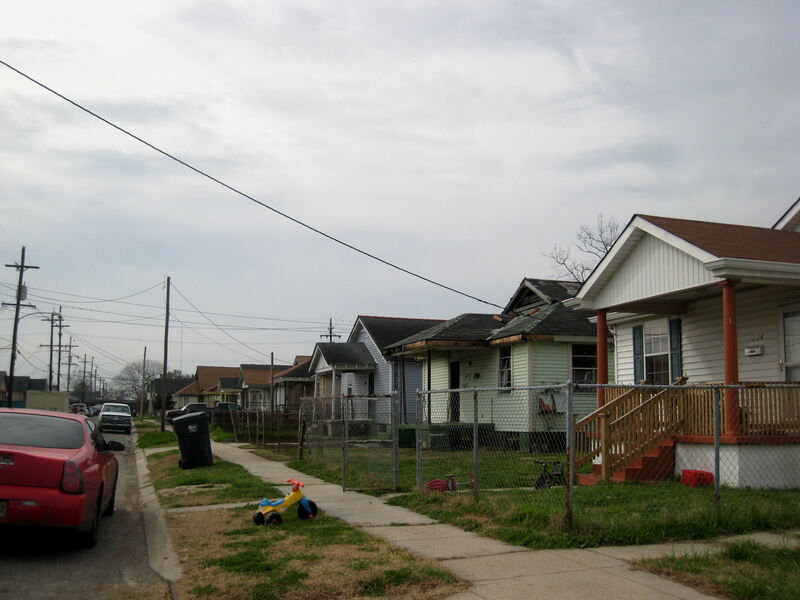 In the days after floodwaters receded, search teams entered every house and other structure in New Orleans, searching for survivors and victims. Many, many houses in the Ninth Ward remain in the same condition they were in after the flood, their owners often living far away from their old neighborhood. Throughout the area there are small signs of rebirth. 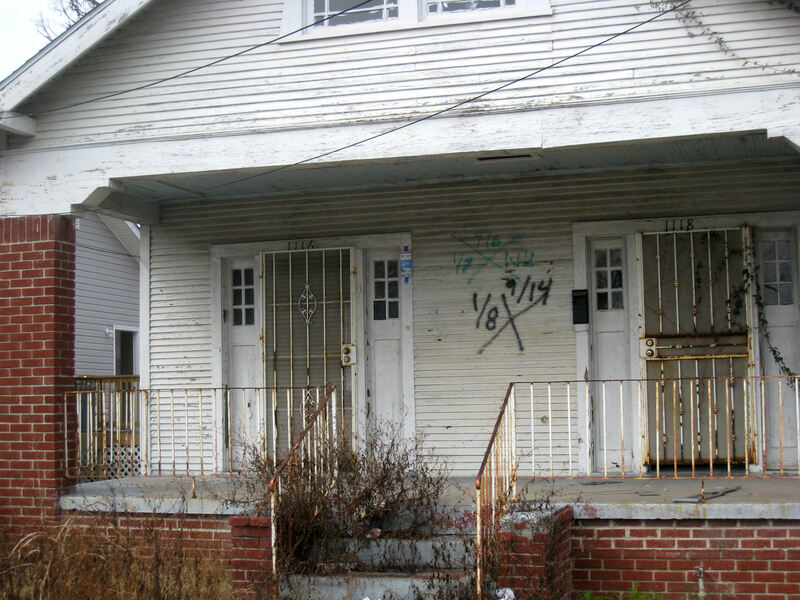 One can only imagine the pioneering spirit required to move back into a house on a street where 90 per cent of your former neighbors' homes are still abandoned and dilapidated. We did some letterboxing while visiting the city and were fascinated by this stamp we found in one of the logbooks. 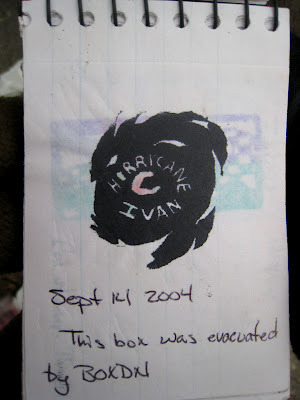 Apparently one of the local Louisiana letterboxes evacuated some boxes to keep them safe when Hurricane Ivan came through the Gulf in 2004 and returned the boxes to their hiding spots once the danger had passed. Now that's what we call above and beyond the call of letterboxing duty! 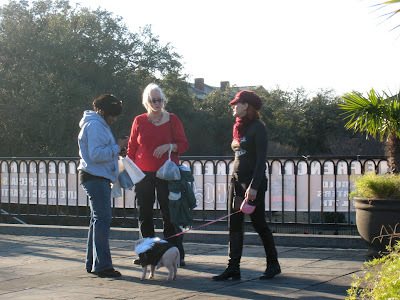 Despite all its travails, New Orleans still attracts all types of Characters with a capital C. Nowhere is a more entertaining place to people watch than Jackson Square where we saw this woman walking her pet pig, who was dressed up in angel wings. Our cousin Tom took time from his busy schedule to treat us to lunch and a visit near the Superdome, where he is managing a massive remodeling and updating project. All the exterior of the arena is being recovered, escalators are being added, and other massive improvements are underway. Sounds as if it will be like new when they are finished. Finally this time in New Orleans we were determined to have a Cafe Du Monde beignet before leaving. The original Cafe du Monde Coffee Stand was established in 1862 in the New Orleans French Market. The cafe is still open 24 hours a day, seven days a week, closing only on Christmas Day and when an occasional hurricane passes too close to the city. 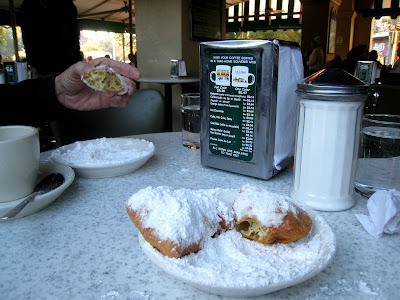 Cafe du Monde is well known for its coffee and beignets-- square French-style doughnuts. 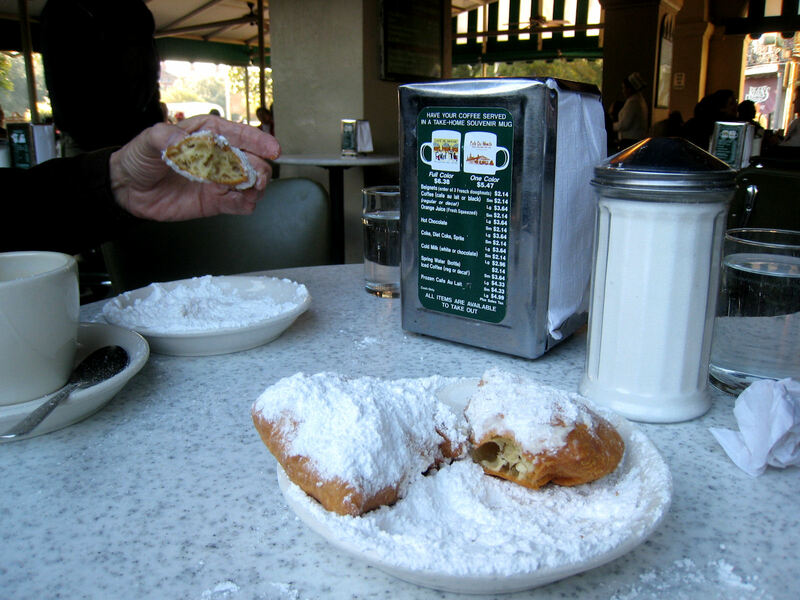 Like many Louisiana traditions, beignets were brought to the area by the Acadians. Originally fried fritters, sometimes filled with fruit, the beignet today is a square piece of dough, fried and lavishly covered with powdered sugar. They are served in orders of three.